Amazon Web Services (AWS) is the undisputed leader of the cloud computing market. According to Gartner, AWS offers “…over 10 times more cloud IaaS compute capacity in use than the aggregate total of the other 14 providers in this Magic Quadrant.” Meanwhile, ServiceNow’s best-of-breed cloud-based ITSM platform is undeniably the most prominent vendor in its market and, according to Gartner, appears on client shortlists “…at more than double the frequency of any other vendor”. Clearly these two tech titans rule the cloud, but up until now, it hasn’t been easy integrating AWS with ServiceNow to leverage both of their strengths together on one platform. With eyeShare, however, this is now possible. More importantly, it can be achieved in just minutes. 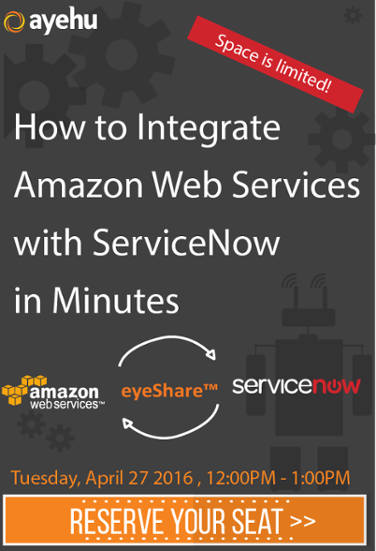 Please join us on Wednesday April 27th for a live, virtual demonstration of how AWS can quickly and easily be integrated with ServiceNow, enabling an entirely new class of self-service for your end-users. Using eyeShare’s IT process automation capabilities, we’ll demonstrate how resource provisioning requests that burden your service desk can be turned into automated workflows that end-users trigger on their own with just a few simple mouse clicks. It’s a demo that will leave you dancing in the clouds. But don’t wait – registration is limited and full attendance is anticipated. Sign up now to reserve your spot and discover how easy it can be to integrate these two cloud computing giants and harness their joint capabilities for the benefit of your IT organization. To register and reserve your spot, please click here. The concept of Service Management and Automation (SMA) is a particularly broad one. As such, there is often some confusion as to what it really entails and, more importantly, the value it lends to an organization. Many people, even IT professionals, mistakenly place more emphasis on the IT Infrastructure Library (ITIL) rather than SMA, simply because they both involve the adoption of a best practice process model. In fact, ITIL is merely a component of well-developed SMA initiatives. According to research conducted by Forrester, in partnership with the USA chapter of the IT Service Management Forum (ITSMF), nearly all large US organizations have adopted some type of ITIL-based approach for their overall Service Management and Automation. Additionally, approximately 60% of IT organizations have embraced ITIL v3 for their operations. Standardized best practices reduce the risk of error and simplify execution, naturally improving the overall productivity of the organization. Automation of manual, repetitive tasks frees up personnel to be able to focus on more important, business critical responsibilities. Instead of having to deal with problems after they occur, staff can prevent them from ever happening. IT automation delivers a level of productivity that simply cannot be achieved through manual efforts. When processes are clearly defined and expertly deployed, there is a significant reduction in errors, producing a subsequent boost in service levels. End users and customers will begin to hold their service providers in a higher regard. This, in turn, creates and fosters a sense of loyalty and provides a certain competitive advantage for the organization. One of the most important components of an IT organization’s viability is its reputation. It only stands to reason, then, that by improving the processes that are in place, both internally and externally, the overall view of the enterprise as a whole will be improved. Better output begets better input and it becomes an ongoing cycle of improvement. If the services of an organization are consistently deemed to be quality and trustworthy, the organization itself will be viewed in the same respect. There isn’t a successful business on the market today that isn’t concerned, to some degree, about budget. You simply can’t be profitable unless you find ways to reduce operational costs and expenses. While ITIL and SMA do require some investments in order to achieve the benefits above, if they are deployed and managed successfully, those investments will see significant return over time. What’s more, as Service Management and Automation efforts continue to improve and mature, the impact on operational cost reduction will also continue to improve. It’s becoming increasingly evident that as technology evolves, the adoption of ITIL as a component of a robust and comprehensive Service Management and Automation initiative will become essential to the success of any organization. IT professionals are probably already aware of the many benefits IT service management (ITSM) and automation present when used individually. What many have still not taken advantage of, however, is the enhanced positive impact combining the two together (ITSM automation) can have on both operations as well as the business as a whole. Here’s how. As you can see, some of the benefits of each of these disciplines when used individually overlap. Finally, let’s go over some of the ways combining the two into IT service management automation can further enhance these benefits. 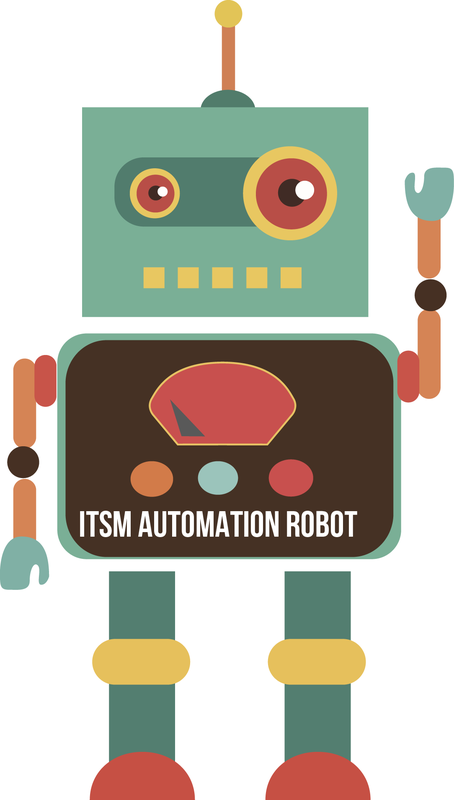 These incredible results make it that much clearer that ITSM automation is the way of the future when it comes to leveraging both IT best practices and sophisticated process automation tools. Where one alone can be powerful, combining the two will bring business benefits to the next level. Are you ready to develop and implement an effective IT service management automation strategy for your organization? It all begins with a simple download. Start your free 30 day trial today and learn firsthand how you can put this strategic combination to work for your business! Discover how I&O Automation can transform your organization. You’ll see increased efficiency while your operating costs go down. Automate everything from job scheduling to server management. If you haven’t yet heard of this amazing technology called IT Process Automation, then it’s high time you come out from below that rock you’ve been hiding under. In simplest of terms, ITPA takes the specific pain points within a business – those time-consuming, manual tasks that are sucking up valuable resources and killing productivity – and automates them to instantly improve efficiency and service levels, reduce recovery time and so much more. But that’s all generally speaking. What are the real, meat and potato reasons why CIOs, IT managers and production operation support teams are adopting IT Process Automation? 1. Automating the remediation of incidents and problems. Not only does this free up the resources of time and manpower, but it also significantly reduces human error associated with manual incident monitoring and management. An alert comes in, it automatically gets assigned to the appropriate person, and it’s easily tracked from start to finish. 2. Empowering frontline IT operators (L1 and L2) to resolve more incidents faster. Automation eliminates the need for escalation to higher level teams, freeing those high level employees to focus on more important business-critical matters while empowering lower level staff to take on more responsibilities. This also reduces turnaround time because there’s less red tape. 3. Reducing floods of alerts from monitoring systems and event sources. Better organization and management of incoming alerts means better service levels and fewer delays for delivery of that service. Critical alerts are prioritized and assigned immediately to the correct party for timely and accurate resolution. 4. Automating repetitive maintenance procedures and daily operational tasks. IT professionals possess skills and talent that could be much better allocated elsewhere than simply spent processing repetitive operational tasks. Automating these tasks, such as password resets and service restarts, let’s technology do the heavy lifting, freeing up talented personnel to be able to focus on key issues that would further improve service levels. 5. Creating a consistent, repeatable process for change management. Effective change management is all about organization. IT Process Automation provides management with the tools they need to create comprehensive processes that can be used again and again to produce the same desired results over time. 6. Connecting ITIL best practices with incident and problem management processes. The goal of any operation should be to manage workflow in a manner that is the most efficient and effective, both internally and externally. When ITIL best practices are integrated with the best practices in place for incident management, the organization as a whole becomes much more productive and profitable. 7. Documenting and capturing incident resolution and audit trails. Staying compliant with government and other regulatory bodies remains a top priority among businesses across just about every industry. ITPA provides the ability to consistently remain in compliance and be well prepared should an audit take place. 8. Building an up-to-date knowledgebase to reduced training time and cost. Bringing new employees up to speed costs time and money. Having a comprehensive knowledgebase and easy to implement and learn software reduces the time spent training, improving efficiency of both existing and new employees. 9. Integrating on-premise systems management tools and process with ITSM tools. Service management and IT Process Automation go hand in hand. By joining the two, your organization will be better poised for success. 10. Establishing end-user self-service portal for better services and fulfillment requests. Technological advances have empowered people to be able to manage so many of their day to day tasks on their own. IT Process Automation leverages this concept, providing self-service options for the end-user which subsequently improves customer service and operational efficiency at the same time. Ready to jump on the IT Process Automation bandwagon?